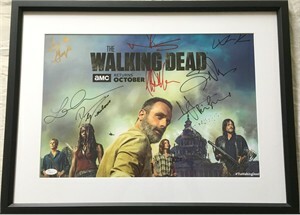 Walking Dead 2018 mini poster autographed in various pens by stars Andrew Lincoln, Norman Reedus, Lauren Cohan, Danai Gurira and Jeffrey Dean Morgan plus director and executive producer Greg Nicotero and executive producers/writers Scott Gimple and Angela Kang for a total of 8 signatures. Professionally matted in white and framed with glass in black wood, ready to hang. Framed size is about 18 1/2 by 24 1/2 inches. 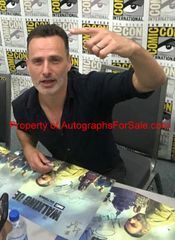 Obtained at extremely limited 2018 San Diego Comic-Con signing with photo of Lincoln signing. 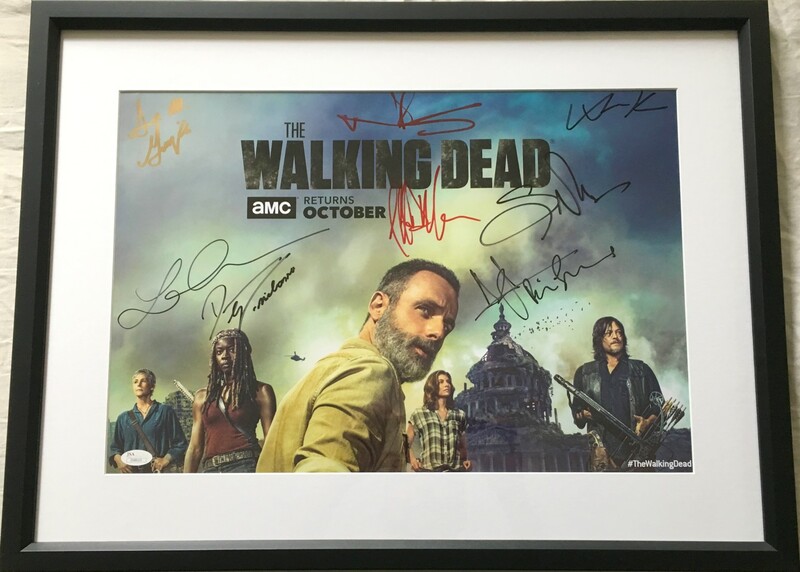 Authenticated by JSA with their numbered sticker on the poster and Letter of Authenticity.